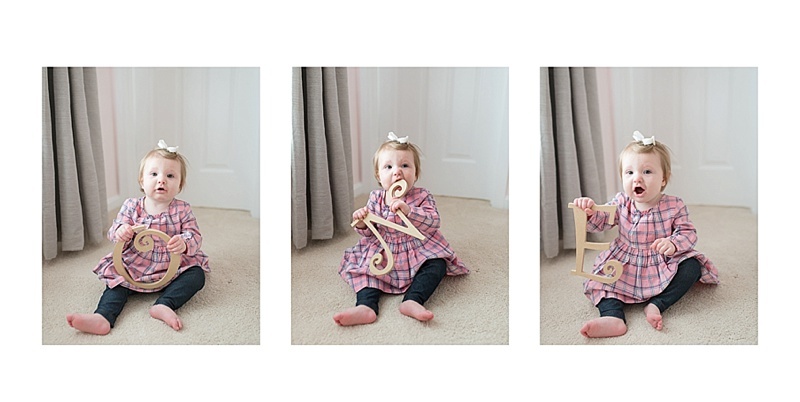 Everley Turns One | An In-Home Lifestyle First Birthday Photography Session in Leesburg, VA — Northern VA Newborn, Maternity, and Family Photographer serving Ashburn, Leesburg, Purcellville, & Loudoun Co.
Meet sweet little Everley! This calm, laid-back girlie turned one this past January and I was so excited to go to her beautiful home in Leesburg, VA to take some first birthday photographs to help her Mommy and Daddy remember this special time! Isn't it CRAZY how much babies grow and change in their first year? I mean, just one year ago, Baby Everley was a teeny-tiny little newborn and now look at her! All grown-up and beautiful, standing up, learning to walk...it's completely amazing and wonderful! Everley has a sweet big sister, Lillian, who was a wonderful photo assistant- check out the picture of her helping me take photos of her little sis. It was SO adorable. Both girls were so well behaved, kind, and super smart. I love going into my clients' homes for sessions like these because everyone is totally comfortable and in their element. The girls loved showing me their toys and were proud of their bedrooms! It was also great to sneak in some family portraits as well during our time together and I hope that Heather and Chris will treasure them for years to come! Heather and I taught together for many years and it is so neat watching her be a mom now to her sweet girls. She is a wonderful mother, just as she was a wonderful teacher! One thing I really loved about their family is that they were totally down for an adventure! I got to their home a little early and took a drive around the neighborhood to kill a little time before knocking on their door. At the end of the road, I saw this GORGEOUS spot under some pine trees that was just begging to be photographed. Later during the session, when it started to snow, I asked Heather and Chris if they would be up for throwing the girls in some coats and boots, loading up in the car, and driving up the street- and they said YES! Turns out that my dream spot was fenced with barbed wire (LOL!!) but we were still able to take some cute pictures outside in the girls' happy pink coats and let them catch some snowflakes in their hands. I'm so glad that we did now looking back because that may have been the only tiny bit of snow we will see this winter here in the DC metro area! Thanks again to the Farmer family for a fun session and happy first birthday to Everley! I hope that your custom "O-N-E" collage mounted print looks beautiful in your home and makes you smile when you remember this milestone. May your next year be filled full of love and adventure!